BHUBANESWAR: Mythology has always been a political tool. It is not only now, it has been used by some people to create division and by some to unite people. Now, it depends on the politicians how to use the tool, said celebrated writer and author of Baahubali trilogy Anand Neelakantan. 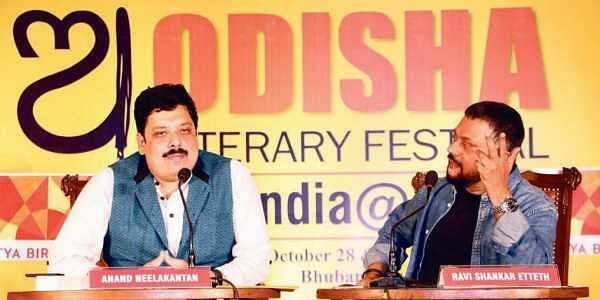 In conversation with senior political columnist Ravi Shankar Etteh on “Does our mythology contradict history?” on the second day of 6th edition of Odisha Literary Festival here, Neelakantan said mythology is nothing but history.“The term mythology is misnomer in India. This is how we tell history. There is nothing called mythology it is ‘Itishas’. We call it history because we see it from western angle. Many of us do not remember history from school books. You ask a villager, he will remember all the dramas of Mahabharat. This is the way we have been narrating history,” he said. The authour of three popular fiction books based on Indian epics of Ramayana and Mahabharata said, some may dispute it but history is also disputed by many. To a question on the conflicting views on Ramayana and Mahabharat, Neelakantan said even there are 300 to 400 version of Bibles. Since they (Christians) have a central authority, they claim this is the Bible. But, this is not the case in India where there is no such central authority to claim the originality of Mahabharata or Ramayana. Noting that every era produces its own mythology, Neelakanthan said there are so many versions of Ramayana. There is a version in the South in which Sita is the daughter of Ravana. There is Buddhist Ramayana where Sita, Rama and Laxman are siblings. In Valmiki Ramayan, Sita is totally different from Tulsidas version. Tulsidas wrote in an era which was under Muslim rule. So the morality of the narrative was different from the Valmki era, he said. “I think nobody can curb the argumentative Indians. They keep arguing for every point and this is the strength of India. The only danger now I am finding is that it is not from the politics,” he said. Neelakantan, who also writes scripts for TV serial like Siya Ke Ram, said the new age people come to know about Ramayan and Mahabharat from TV serials. Television has the habit of catering to the lowest common denominator of India. One cannot give various view points in TV. A slight deviation will create controversy. Narrating his experience, the author said when he deviated slightly from Tulsidas Ramayana he had difficulties from the TV channel as the core viewers were from the Hindi Gangetic region. They only knew the Tulasidas Ramayana.While the older generation know Ramayana as the Ramanad Sagar’s version, the new generation have many TV versions. This is what reflecting in the society, he added.